There is a quote from Alice Walker’s essay, In Search of Our Mothers’ Gardens, that has stayed with me since the first time I read it a few years after graduate school. As a matter of fact, two to three pages of the essay remain imprinted in my memory and excerpts can be found scrawled throughout two of three of my writing journals. Walker’s collection contains thirty-six separate pieces ranging from personal to political, but I confess to having only read the essay from which the overall collection was titled. The essay speaks of the creativity of black women, and women in general, and how their creativity, their artistry was kept alive through decades of physical, societal, and spiritual slavery. The last few pages of the essay, Walker tells us about her own mother and how she must’ve absorbed not only the stories her mother told her, but the rhythm of those stories, their urgency, and significance, “Yet, so many of the stories that I write, that we all write, are my mother’s stories.” (Walker, 407). But, stories were not alone in inspiring Walker; as she goes on to describe the beautiful gardens her mother created, despite poor living conditions, and how those “ambitious gardens” sparked her own creativity and desire to create art. “I notice that it is only when my mother is working in her flowers that she is radiant, almost to the point of being invisible- except as Creator: hand and eye. She is involved in work her soul must have. Ordering the universe in the image of her personal conception of Beauty. This essay is so important to me, because it helped me to recognize and understand my own discoveries. In my “About the Mermaid,” I speak of a young life between two worlds, a young woman unsure and confused about who she is and where she is going. In 2006, when I began writing the stories for my collection, Voices from the North, I began to understand more about myself, as well as a sense of completion. The majority of the stories are based on actual front porch conversations, embellished “remember-that-time” over warm beer, and the soft-spoken recounting of events by my father. The landmarks of my childhood — the old NoMar Theatre, the brain-jarring railroad tracks along 21st and 29th Street, Cudahy meat-packing plant, the brick schoolhouse across from Our Lady of Perpetual Help Catholic Church – appear throughout the collection. As I wrote, as I took those anecdotes and incomplete stories and intertwined them with the characters of my collection, I truly began to understand the lives of my parents, thus my own. My parent’s love of family, the artistry in which they found ways to engage and teach me and my siblings about life outside of our community, the creative ways in which they encouraged us to reach beyond subscribed borders, their work ethic, the filled-to-capacity photo albums, the made from memory and from scratch recipes, are how they “handed down respect for the possibilities.” These were their gardens. An educator in California who responded to my post about my mother’s family, told me she encourages the Hispanic youth she teaches to learn about their descendants, to understand where they truly come from and the people who brought them to this point. I thanked her for doing this, for ensuring young people realize and appreciate those in their lives who have planted fruitful gardens in places they may never see, but should know, envision, and understand. And should the opportunity arise, to stroll through those gardens. Our heritage is more than just geography and last names. Much more. And for me the research, the knowing, continues. 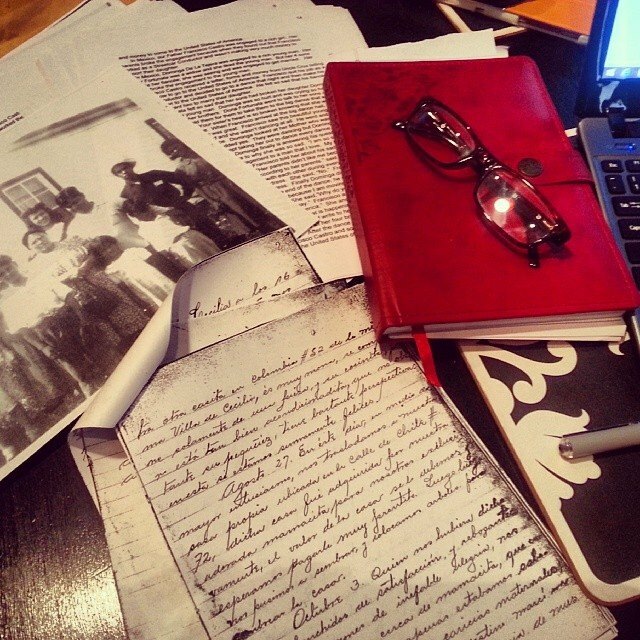 I am writing a novel based on the diary and journal entries of my paternal grandfather, Francisco Castro. This gift was given to me by my Aunt Graciela, the keeper of the history of my father’s family. Enclosed in a plain brown mailer were the copies from the diary and typed historical summaries of life events, trips from Mexico to Kansas, the birth of children, and the loss of mothers. This packet of immeasurable worth has enticed me to walk in yet another garden, the garden of the grandparents I never knew. And this journey through the various plant life, the indigenous flowers, the March blossoms and November blooms, will undoubtedly continue the completion of the story that is me. We should all take the time to walk in the ambitious gardens of those we love and those who inspire us, as well as those we have never known, but whose tender planting and backbreaking care urged the planting of our own seeds and the watering of our belonging. I too am finding out more about myself as I write down the memories that I have been carrying. Now, I know why I can not listen to music…too sad. And why, I am drawn to quilt making. Lots of random things. Thanks for sharing your history. I very much like the mood and the tone of this piece. I especially like the paragraph with the long, multi-clause sentence followed by “These were their gardens.” Nice.